Bio: George Wildman Ball (1909-1994) graduated from Northwestern University in 1930, and received his J.D. in 1933. He was admitted to the Illinois bar the following year. Ball began his career of government service working in the General Counsel's Office of the U.S. Department of Treasury from 1933 to 1935. As a government official, he also served in the Lend Lease Administration, which later became the Foreign Economic Administration, from 1942 to 1944). From 1944 to 1945, he was Director of the U.S. Strategic Bombing Survey in London, England, and briefly following World War II, served as General Counsel for the French Supply Council in Washington, D.C., from 1945 to 1946. Ball became the Under Secretary of State for Economic Affairs in 1961, and from 1961 to 1966, served as the Under Secretary of State. He also served as permanent U.S. representative to the United Nations. 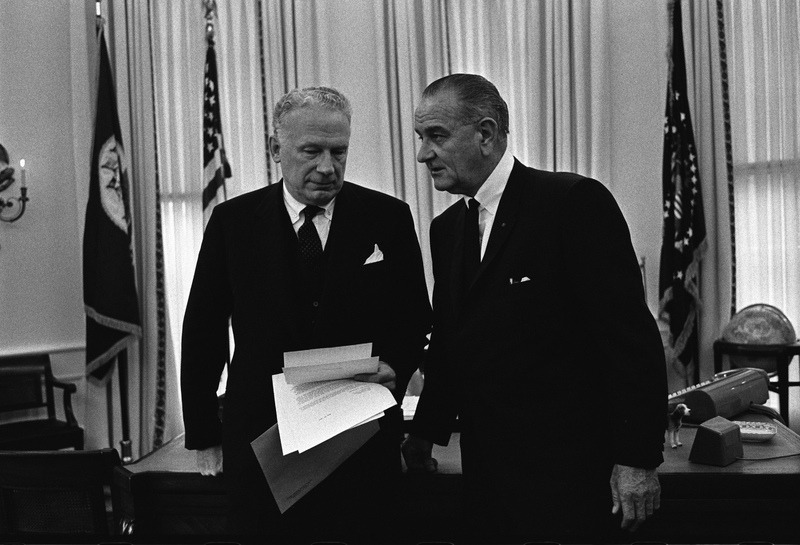 L-R: George Ball, President Lyndon B. Johnson. Meeting, Oval Office, White House, Washington DC, 5/25/1967. Photo # a4187-17a by Yoichi Okamoto. White House Photo Office collection, LBJ Presidential Library, public domain.